I’m Carter, a children’s book author. You can use the menu to find out more about me, my books, events, and how to get in touch. Maurice rides his bike to his shop every day. Lotta rides her bike to collect sticks every day. Both go about their separate routines, unaware of the friendship that awaits them just a few blocks away. But what happens when a branch and a lemon peel get in the way? This delightful falling-in-like story from acclaimed picture book creators Carter Higgins and Zachariah OHora celebrates the power of coincidence to lead us to the friends we’re meant to meet all along. 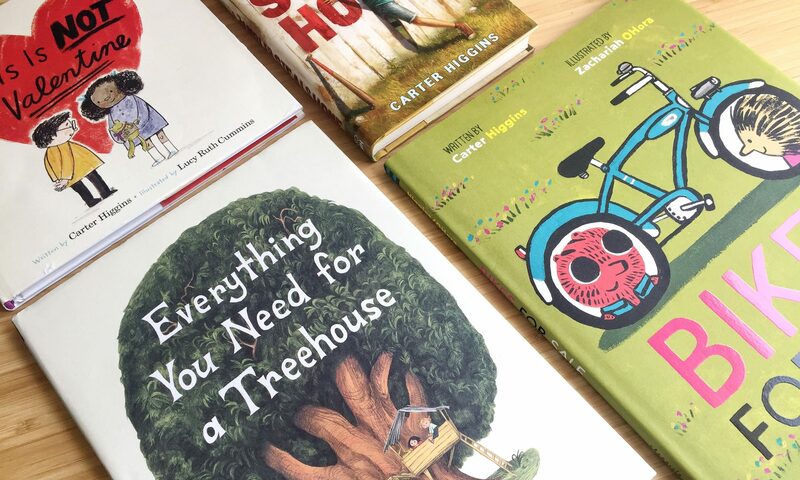 This magical work of art from acclaimed picture book creators Carter Higgins and Emily Hughes celebrates the universal wonder of treehouses and all the adventure that live among branches. This book is not a valentine. It doesn’t have lacey edges or sugary hearts. But it is full of lucky rocks, secret hiding spots, and gumball machine treasures. This is a book about waiting in line and wishing for cinnamon buns. About recognizing that if you care so much about someone not thinking you care, maybe you really do. But wait—isn’t that exactly what love is about? Maybe this book is sort of a valentine after all. A testament to handmade, wacky, bashful, honest love—sure to win over the hearts of all readers—this offering from debut picture book author Carter Higgins and children’s book veteran Lucy Ruth Cummins is the perfect gift to celebrate every relationship, from parent to child, sibling to sibling, partner to partner, crush to crush. I’d love to come visit your school! I was a school librarian for a decade, so I have been on the other side of the desk planning author visits. My biggest goal is shared with yours: to celebrate books and encourage readers. If you have more questions, or would like to plan something specific, please email me. This fee schedule applies to the 2018-2019 school year. What kind of visit can you expect? A Half Day visit is two 45-minute sessions plus an optional signing and/or small group meet and greet. Half Days are only available in the Los Angeles area or as an add-on after a Full Day visit. A Full Day visit is up to four 45-minute sessions plus an optional signing and/or small group meet and greet. My presentations change based on new book releases, but are always based around the theme of how reading and writing as a kid prepared me to be an author as a grownup. I love to talk about how books are made, where ideas come from, how many drafts it took, and how being a reader is the most important thing you can be. I am available to talk to students in grades K-8. Are you looking for a more intimate writing workshop? Let’s talk! I was a school librarian for a decade, so collaborating on something especially meaningful to you would be a joy. *Fees can be split between schools within a reasonable area. I’d love to meet your students virtually as well! If your school doesn’t use Skype, I am also available on Google Hangouts. 20-minute readaloud and/or Q+A: FREE! Are you ready to book a visit, either in person or via Skype? Or do you have any questions? Email me! Don’t see something that works for you? Let’s also chat. Wondering why to pay for an author visit? This post might help. 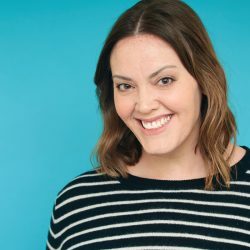 If I can’t meet you, I’d love to hear from you! You can also sign up for my newsletter! Click here to subscribe. For writing inquiries, please contact my agent, Rubin Pfeffer of RP Content.